The items included 20 computer sets, 20 UPS, two printers and a generator from the members of the Aboderin family, who visited the schools as part of the activities marking the 30th anniversary of the death of the founding Chairman of The PUNCH, the late Chief James Olubunmi Aboderin. The Aboderins also promised to construct a block of classrooms for the use of the pupils. Interestingly, the two schools are in the same premises. However, that was not the end of the gesture. Each of the pupils of the two schools also received materials comprising exercise books and raincoats to protect them from harsh weather. Leading other members of the family, Mrs. Angela Emuwa, who represented the Chairman of The PUNCH, Mr. Wale Aboderin, said their late father was a philanthropist who gave priority to education. The Managing Director, PUNCH Nigeria Limited, Mr. Ademola Osinubi, was also on the entourage to the schools. Emuwa said, 'We believe in value-added education and to this end and in line with the vision our late father, we will be donating 20 computer systems, 20 UPS, two printers and one generator and a class room block. She said the family would not leave the schools but would be back to visit the computer centre and to monitor the progress of the pupils. Stressing the importance of good education, Emuwa, who urged wealthy individuals and organisations to contribute to education development, noted that the government alone could not finance the sector. According to her, education remains a potent tool for any nation's development, and in creating an enabling environment for pupils to lead a brighter future. The Ogun State Commissioner for Education, Science and Technology, Mr. Olusegun Odubela, who commended the Aboderin family for the gesture, noted that education was an elixir for the development and emancipation of humanity. He also urged stakeholders in education to support the government in providing qualitative and functional education for the citizenry. According to Odubela, the donation by the Aboderin family is a testimony to the commitment of dedicated stakeholders and philanthropists to supporting education development in the state. He said, 'These are testimonies to the strong determination that a new era, aimed at building our educational sector, has commenced. Odubela said the state government had committed enormous resources to schools' rehabilitation and construction of laboratories, among others. The commissioner, while acknowledging the gesture of the Aboderin family, in supporting the state government in rebuilding the education sector, appealed to them to adopt the schools. The Principal, Magboro Community High School, Mrs. Josephine Madubuike, in her remarks, said the gesture would positively affect the fortunes of the pupils and their teachers. 'We are grateful to you for choosing our school. And we pray that God will continue to be with the children and grandchildren of the late Aboderin,' she said. The Baale of Magboro 1, Chief Modiu Ademuyiwa, also expressed his satisfaction over the donation, praying God to reward the family abundantly. The Aboderins, in company with the commissioner were taken on tour of the schools by the principal. Meanwhile, the family will pay a visit to the resting place of Chief Aboderin at St. David's Church, Kudeti, Ibadan, Oyo State on Friday (today) by 9am. They will also be visiting their late father's Alma Mater, Ibadan Municipal Government School, Aperin, in Oyo State, at 11:30 am. They will tour the facilities and distribute educational materials to the school. 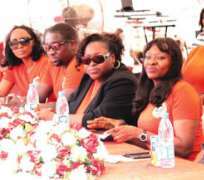 The grand finale tagged 'Legacy Ball' holds on Saturday at Intercontinental Hotel, Victoria Island, Lagos.